Selection and control of the various passenger compartment lamps. 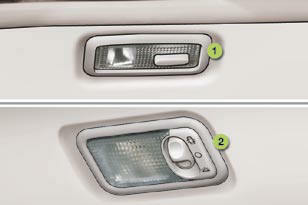 - when a door is opened, - when the remote control locking button is activated, in order to locate your vehicle. - when the vehicle is locked, - when the ignition is switched on, - 30 seconds after the last door is closed. - with the engine running, unlimited. 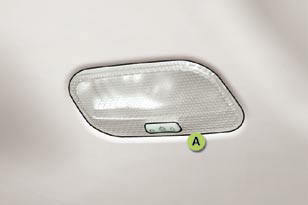 To switch off the rear courtesy lamp, place it in the "permanently off" position. With the ignition on, the fi rst press of the corresponding switch switches on the reading lamp concerned in permanent lighting mode. - when a door is opened, - when the remote control locking button is pressed, in order to locate your vehicle.